I have been with CRIS for a few years. No complaints so far. Fast payouts, Great Customer Service, the site is never down. I will stick around for a while. I've played BetCris for almost 5 years and never had any problems. They are among the leaders in the industry. 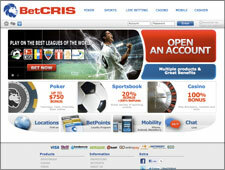 Write a Bet Cris Review and share your thoughts with other players.